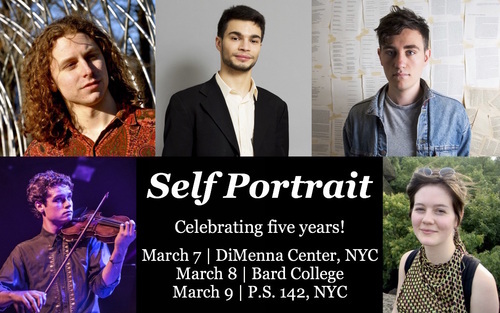 Self Portrait presents five works commissioned by Contemporaneous, including four world premieres and works by artists in the ensemble. The diverse pieces explore the rich, often complex, relationship between music and self-expression. Taken together, they offer a picture in sound of the ensemble at the present moment, informed by its history and imagining its future. On March 9, 2015, Contemporaneous performs at P.S. 142, a public elementary school on Manhattan’s Lower East Side, as a benefit for the school’s music program. Presented by the Neighborhood Classics Series, this concert features Contemporaneous performing alongside Kaufman Music Center’s teenage new music ensemble, Face the Music. Tamzin Elliott, whose work The New York Times has described as “effervescent” and “fresh,” has set her poetry to music in a new cycle of songs that feature soprano Lucy Dhegrae. Drawing on disparate traditions, of songs for singer and large ensemble from Mahler to Frank Sinatra, Elliott’s music is intimate, vulnerable, and deeply affecting. Dylan Mattingly’s Lighthouse (Refugee Music by a Pacific Expatriate) is inspired by the composer's hometown San Francisco Bay, while Finnegan Shanahan’s Water Cycle (Music for a Hudson River Railroad Dream-Map)reflects on the river that stretches from New York City up through Shanahan’s native Hudson Valley. Impulses, by Brazilian composer and Contemporaneous clarinetist Vicente Alexim, is marked by high-energy bursts to propel and shape its dramatic transformations. Contrasting with this is the serene beauty of Still Life for Ensemble by Contemporaneous percussionist Matt Evans. Self Portrait is funded by donations from 218 funders from an online fundraising campaign. We would like to express our deepest gratitude to these donors. Self Portrait was supported by New Music USA. For more about this project, visit my project page. Self Portrait is made possible in part with public funds from the Manhattan Community Arts Fund, supported by the New York City Department of Cultural Affairs in partnership with the City Council and Administered by the Lower Manhattan Cultural Council.